While you need only give four months notice of your intention to marry it is common practice for a couple to book the church a long time in advance. So it is important to contact the Parish Office to make sure that the church is available on the day you require. You will also need to look at participating in a marriage preparation course which is a lovely way for you as a couple to take a look at your own relationship. The Civil Authorities also have state requirements which must be fulfilled. Go to a priest in the parish of the bride at least THREE MONTHS before the date on which you plan to marry. The meetings of the couple with their priest are a key part of the preparation process. These meetings have taken on a new significance in recent times, because it can no longer be assumed that seeking a Church wedding is an expression of Christian faith on the part of one or both partners. These meetings are an opportunity for a couple to reflect on what Christian marriage asks of them. The priest will also begin the process of filling out Pre-Nuptial Enquiry Forms and advise you about the various documents that you need to collect. You will need to get a Certificate of Baptism from the parish in which you were baptised and a Certificate of Confirmation from the parish in which you were confirmed. These documents should be issued no less than six months prior to the date of marriage. Freedom to marry: The rules governing freedom to marry in the Catholic church can be complicated. The best advice when one party has been married previously (either in a civil or religious ceremony) is not to make arrangements until the diocesan office has been consulted. Mixed Marriages: Special permissions are required for full church recognition of marriages between a Roman Catholic and a baptised non-RC or someone unbaptised. Applications are handled by the diocesan office once the priest of the catholic party has forwarded the standard paperwork. It is recommended that all couples who are getting married should attend a Pre-Marriage Course . You can get an application form from a priest in your parish. It is better to attend the Course well before the date of the Marriage. Normally a priest from the bride’s parish officiates at the marriage ceremony, assuming that the ceremony takes place in the bride’s parish. If you wish to have some other priest (e.g. a relative or friend) officiate, inform the priest in the parish where the ceremony is to take place and he will give the necessary authorisation. In Civil Law, it is now a legal requirement for the solemniser (the priest who officiates at the marriage) to be on the ‘List of Solemnisers’ submitted by each local Bishop to the Registrar-General. Celebrants From Overseas: All diocesan priests in the Republic of Ireland are on the State’s ‘List of Solmnisers’. In order for a priest from oversees to be placed on this list in a temporary capacity, it is necessary for him to send his name, address and telephone number to the Diocesan Office. The Diocesan Office in Carlow will then contact the officiating priest to formalise matters with him. To celebrate the sacrament of Marriage does not require the celebration of Eucharist (Mass). While it has been generally the custom, it may not always be appropriate for example in a “mixed” marriage or when a couple are not regularly practising. Some couples today find the celebration of Marriage without the Eucharist, to be more appropriate for them. Marriages on Sundays, Holydays and some special Church celebrations (Christmas Eve, Christmas Day, St.Patrick’s Day, Holy Thursday, Good Friday, Holy Saturday, Feast of All Souls) are not permitted in this Diocese. If you have any further queries regarding your Church Ceremony, please contact the Parish Office. 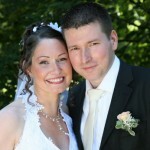 You may also find the following links helpful http://www.together.ie/ and http://www.gettingmarried.ie/.